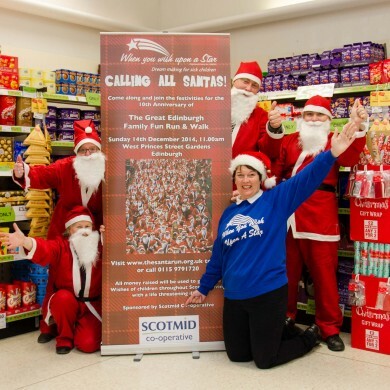 Aidan & team at South Queensferry get into the Santa Run spirit! Scotmid Co-operative is the title sponsor for the Great Edinburgh Santa Family Fun Run and Walk 2014 which will be held on Sunday 14th December at 11am in West Princes Street Gardens. A real family event, where even the family pet is welcome to come along, The Santa Run raises funds for the charity, When You Wish upon a Star. 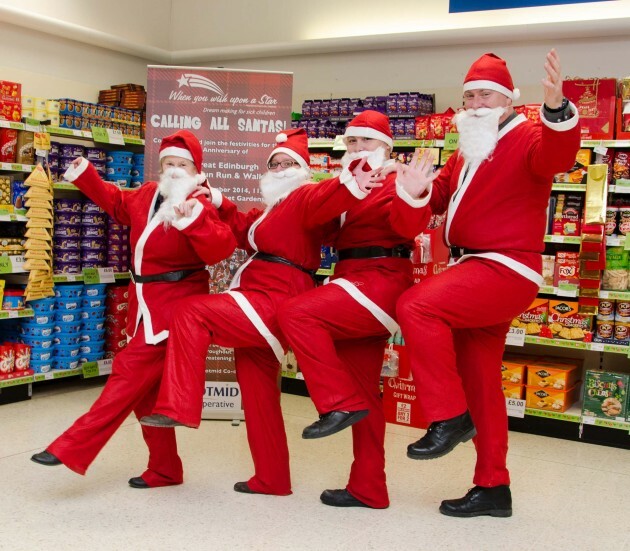 The monies raised will enable the Charity to take hundreds of sick children to Lapland to meet the real Father Christmas and take part in magical adventure including skidoos, snowmobiles, husky rides, quad bikes, sledging, skiing and of course, sleigh rides with Rudolph in the Enchanted Forest. Businesses and companies are also welcome to put together a team and join in the run, walk or stroll around West Princes Street Gardens, over a short 2km or 5km circuit. Prizes will be given for the ‘Best Decorated Pushchair’, ‘Best Dressed Dog for Christmas’, ‘Best Individual Fundraiser’ and ‘Best Fundraising Company Team’. The event is a great way to enjoy time with friends and family or work colleagues whilst raising money for a deserving cause all money raised from the event goes to When You Wish Upon a Star, which aims to grant the ‘Wishes’ of children throughout Scotland suffering from life-threatening illnesses.